A high-performance training top that provides maximum breathability and comfort whether you’re running, biking or training, the Comet Lite Short Sleeve Zip features a technical design with a sleek, flattering fit. The Comet features Icebreaker's lightweight jersey Cool-Lite™ fabric, an advanced blend of natural Tencel®, stretchy Lycra® and their corespun fibers—nylon threads wrapped in merino wool for the ultimate combination of next-to-skin softness and durability. This highly breathable and odor resistant blend expertly manages moisture, while the zip-neck design and strategic panels of merino-blend eyelet mesh under the arms and on the back increase ventilation when you’re working hard. Forward-set side seams and the raglan sleeve construction help eliminate chafing and improve comfort. Comet Lite SS Zip- Womens is rated 5.0 out of 5 by 3. Rated 5 out of 5 by RunningLady from Versatile shirt I bought this shirt for 2 uses: to wear for winter running to adjust my core temperature as required when running and for summer biking. 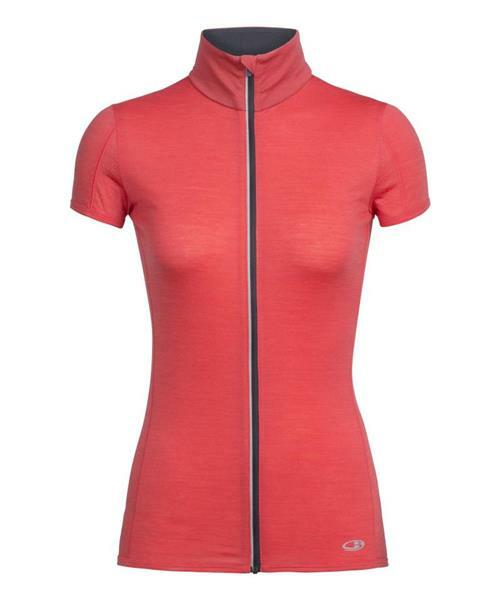 I have used it this winter for running; I wanted a short sleeved zippered top as a layer for very cold days when I wanted something extra for the core only and I wanted the ability to shed heat by unzipping the top as required. I wear this over a base layer and then another layer; this is a top up adjustable layer. Like all Icebreaker it works very well; my other layers are Icebreaker. It adds enough warm for the cold days and it is adjustable so I am not locked in to a set of layers. Rated 5 out of 5 by KEM2018 from Love the fit. Love the look. This was a great purchase. Have worn it kayaking and hiking. Lightweight, breathable & super comfy. Fits true to size. Very happy with this purchase. Rated 5 out of 5 by SKtraveller from Good investment Wanted to add to my collection of Icebreaker clothing and came across this. Love the fit. I wear a small shirt but bought a medium Comet short sleeve so it can be worn alone or on top of a T-shirt. Works perfectly as either so it’s multipurpose for my travels.